New Service to Lāna‘i City Starts June 17th — Book Now! 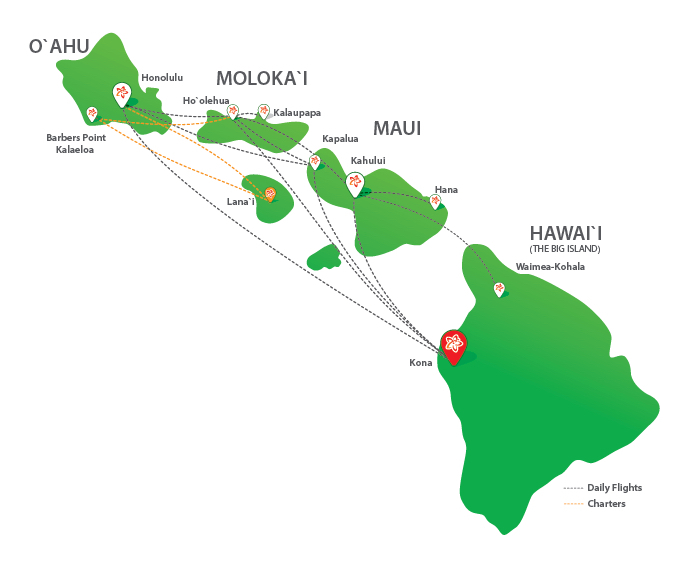 Fly Mokulele Airlines to Lana’i and you’ll find a pristine and romantic setting with the privacy for which it has become known as “Hawai’i’s Most Enticing Island.” On Lana’i there are luxurious resorts, two championship golf-courses, and outdoor adventures unique to Lana’i’s distinctive landscapes. If you want to get away from it all, get away to Lana’i. On Lana’i you can watch for humpack whales, spinner dolphins or play 18 outstanding holes at The Challenge at Manele or The Experience at Koele. On Lana’i there are luxurious resorts, two championship golf-courses, and outdoor adventures unique to Lana’i’s distinctive landscapes. If you want to get away from it all, get away to Lana’i. On Lana’i you can watch for humpack whales, spinner dolphins or play 18 outstanding holes at The Challenge at Manele or The Experience at Koele. Delivering schedule reliability & on-time flights are our top priority. Because 2 pilots are always safer than 1. Get the best deals on your flights. Have questions? Our customer care team is open daily and happy to help you.